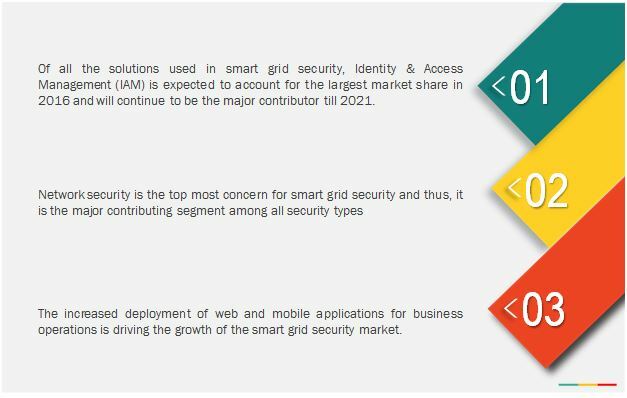 [157 Pages Report] The smart grid security market size is estimated to grow from USD 4.29 billion in 2016 to USD 7.00 billion by 2021, at a Compound Annual Growth Rate (CAGR) of 10.3% during the forecast period. 2015 is considered the base year, while the forecast period is 2016–2021. Most of the countries are transforming the traditional grid to smart grid technology. There are around 100 smart grid deployment projects across the globe, distributed among various phases of the smart grid deployment such as Advanced Metering Infrastructure Residential (AMI R), Advanced Metering Infrastructure Industrial (AMI I), Peak Load Management (PLM), Outage Management System (OMS), and Power Quality Management (PQM). The most number of smart grid projects in North America are in developed countries such as the U.S. and Canada. A large number of smart grid projects in U.S. are funded by the American Recovery and Reinvestment Act of 2009 (ARRA). The Smart Grid Fund in Canada has been supporting the deployment projects since 2011. Asian countries have the second largest number of smart grid projects with the Indian Smart Grid Forum accounting for the highest implementation of smart grid projects in India. The New Energy and Industrial Technology Development Organization (NEDO), along with local utility bodies, is implementing smart grid projects in Japan. The smart grid security market ecosystem comprises smart grid security vendors, such as BAE Systems PLC (U.K.), IBM Corporation (U.S.), Cisco Systems, Inc. (U.S.), Intel Corporation (Intel Security) (U.S.), Siemens AG (Germany), Symantec Corporation (U.S.), N-Dimension Solutions (Canada), Elster Solutions (U.S.), AlertEnterprise (U.S.), and Leidos (U.S.); service providers; system integrators; and enterprises. Other stakeholders of the market include security service providers, national/state governments, cloud service providers, utility companies, IT service providers, resellers, enterprise users, and technology providers. In November 2016, Siemens expanded its strategic alliance with Atos and strengthened its capabilities in the field of Industrial Security, Machine Intelligence, Industrial Data Analytics, Service Enhancing Technologies and Web of Systems. In October 2016, N-Dimension partnered with Wortham Power Gen Insurance, a leading power utility insurance broker, to deliver a cost-effective security solution to utility companies along with backup insurance. What are the new opportunities which the smart grid security vendors are exploring? 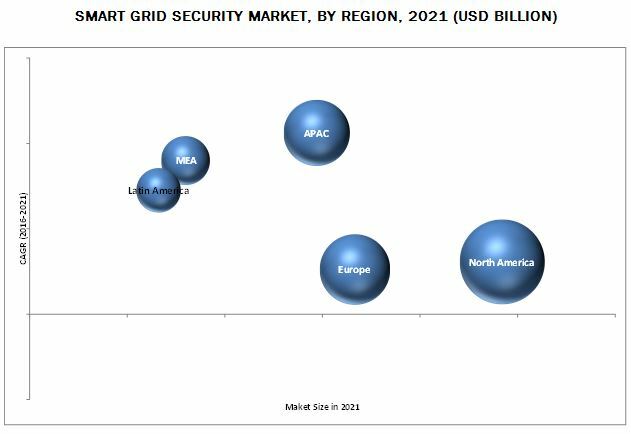 The smart grid security market size is expected to grow from USD 4.29 billion in 2016 to USD 7.00 billion by 2021, at a Compound Annual Growth Rate (CAGR) of 10.3% during the forecast period. The major growth drivers of the market include the global development of smart grids and increased sophistication of cyber-attacks. The smart grid security market includes solutions and services that are provided to secure the critical infrastructure of a smart grid. A whole new range of applications and technologies, such as Supervisory Control and Data Acquisition (SCADA)/Industrial Control System (ICS), Advanced Metering Infrastructure (AMI), demand response management system, and home energy management are introduced in the grid system to improve the transmission & distribution process and minimize energy consumption. Major security types in smart grid security are network security, application security, database security, and endpoint security. The application security is expected to grow at the highest CAGR during the forecast period because of the growing trends of smart grid, Internet of Things (IoT), and connected devices. Network security holds the largest share of the smart grid security market in 2016. The growth is fueled by the growing attacks on the critical infrastructure in utility organizations. The application security is expected to grow at the highest CAGR during the forecast period due to the increasing adoption of web and mobile-based business applications, which are susceptible to advanced cyber threats. The demand-response subsystem is expected to grow at the highest CAGR, due to the rising need of organizations to balance the energy demand and supply and for efficient business operations. 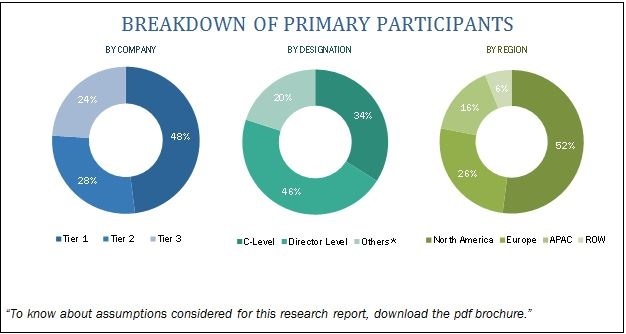 The global market has been segmented on the basis of regions into North America, Europe, Asia-Pacific (APAC), Middle East and Africa (MEA), and Latin America to provide a region-specific analysis in the report. The North American region, followed by Europe, is expected to become the largest revenue generating region for smart grid security vendors in 2016. This is mainly because in the developed economies of the U.S. and Canada, there is high focus on innovations obtained from research and development and technology. The APAC region is expected to be the fastest growing region in the smart grid security market. The growth in this region is primarily driven by the growing adoption of smart grid, web, and mobile-based business applications. ICS is a software & hardware integrated system that controls and monitors the industrial operations performed by different machineries. ICS includes different technologies, such as Distributed Control Systems (DCS), SCADA, and PLC. SCADA is a process control software application that acquires real-time information from different locations and controls equipment & conditions. It includes hardware and software components and is used in power plants. ICS security is the ability of organizations to secure their automation processes and related critical information from cyber intrusions for an uninterrupted and sustained productivity of utilities & grids. Securing these systems has become a major concern in the present age of APTs, such as Stuxnet and Havex RAT. Hence, the market for ICS/SCADA security seems to witness a significant share in the total smart grid security market. AMI is the combination of devices, solutions, and services that enables two-way communication between utilities and consumers. AMI detects outages and facilitates real-time energy consumption patterns for end-users, thereby providing personalized tariff plans & other enhanced services. A continual stream of revenue is not only generated by smart meter rollouts, but also through appropriate services & capabilities in Meter Communication Infrastructure (MCI) and Meter Data Management (MDM). Due to these functions and features of AMI, it becomes an important component in the smart grid infrastructure, whose protection is key objective of the utility companies. The rapid adoption of smart grid technology in emerging economies indicates the growth of AMI security in the recent years. Demand response is a change in the energy consumption of an electric utility customer to enhance the balance of demand for power with the supply. Due to the difficulties in energy storage, the power companies try to match the demand & supply of the electricity using demand response system. This avoids the consequences of generating excess energy and getting trapped in power shortage situations. As demand response management systems is a critical and essential part of smart grid infrastructure, the attack on the system causes huge loss to utility companies. Thus, smart grid industry is heavily deploying demand response security solutions and the market segment is expected to grow significantly in the future. The smart grid security market faces challenges related to maintenance of cyber security standards over time and upgradation of communication protocols. Factors such as lack of security awareness among smart grid stakeholders limit the market growth. Major vendors that offer smart grid security solutions across the globe are BAE Systems PLC (U.K.), IBM Corporation (U.S.), Cisco Systems, Inc. (U.S.), Intel Corporation (Intel Security) (U.S.), Siemens AG (Germany), Symantec Corporation (U.S.), N-Dimension Solutions (Canada), Elster Solutions (U.S.), AlertEnterprise (U.S.), and Leidos (U.S.). These vendors have adopted different types of organic and inorganic growth strategies such as new product launches, partnerships & collaborations, and mergers & acquisitions to expand their offerings in the smart grid security market.